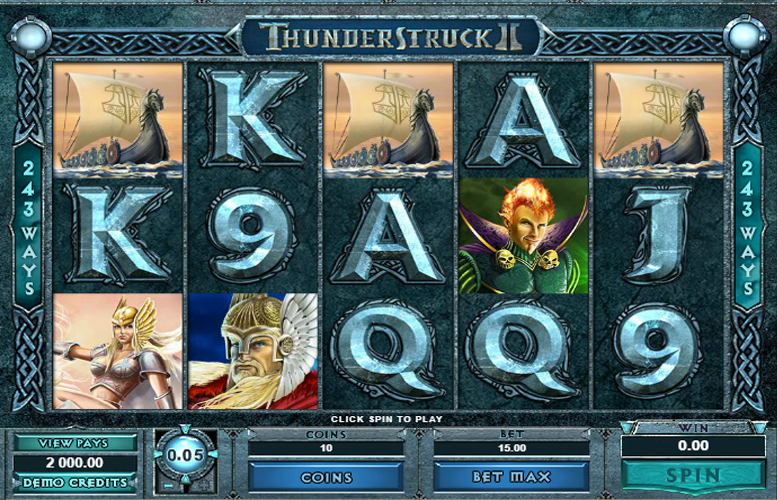 Thunderstruck II from Microgaming takes us to the land of Norse mythology. There are gods and goddesses, along with quests across stormy seas in Viking longboats. In terms of features, Thunderstruck packs loads in. So, let’s take a look already. Tasteful artwork. The illustrations for Thunderstruck II are excellent. This creates a game with a strong feel. Loads of variety in features. It’s possible to play four different free spin modes, along with a few other features. Such diversity lends itself well to repeat visits. Tragically low upper betting limit. We’ve seen many games that let players bet up to £2,000 per spin. This makes Thunderstruck II’s £15 look pitiful. The 2.4 million coin top jackpot on Thunderstruck 2, available via bonus features, is one of the biggest of all the non progressive slots – impressive! Thor = 500x the total bet. Odin = 450x the total bet. Loki = 400x the total bet. Valkyrie = 350x the total bet. Sky Kingdom = 300x the total bet. Long ship = 250x the total bet. The game’s logo symbol will substitute for all other symbols except the “scatter” symbol. Any wins that make use of the “wild” symbol will be paid out at twice the rate of that quoted on the pay table. The Wildstorm Feature can strike randomly. It will turn up to five reels “wild”. 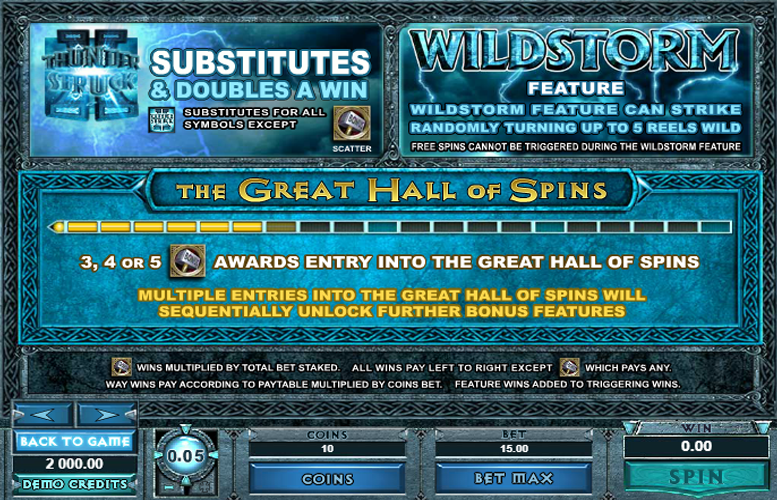 Players should note that free spins cannot be triggered during the Wildstorm Feature. Landing three, four, or five “bonus” symbols anywhere on the reels will award entry into The Great Hall of Spins. Multiple Entries into The Great Hall of Spins will sequentially unlock further bonus features. This bonus mode is available when The Great Hall of Spins feature is first activated. Players will receive 10 free spins that are subject to a 5x multiplier. These can be retriggered. This bonus mode is available from the fifth time the bonus feature is triggered. Players will receive 15 free spins with a wild magic feature. The “wild magic” symbol on reel three will randomly transform symbols into additional substitutes. Two, three, four, or five “bonus” symbols landing on the reels will retrigger one, two, three, or four free spins respectively. 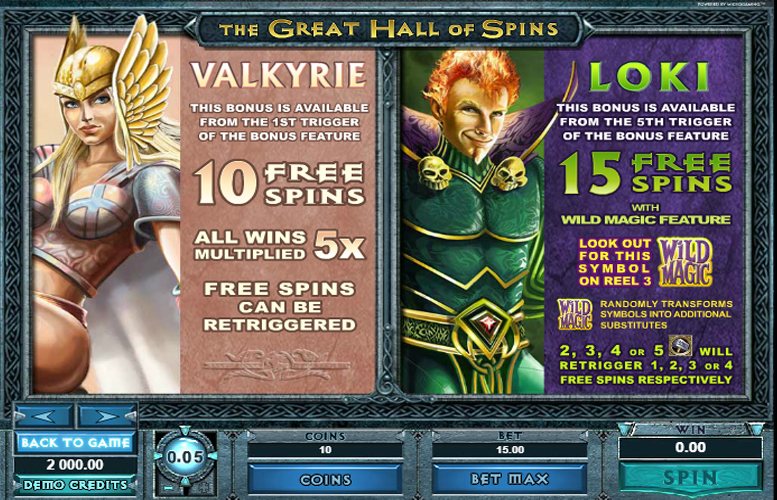 This bonus is available from the 10th trigger of The Great Hall of Spins bonus feature. 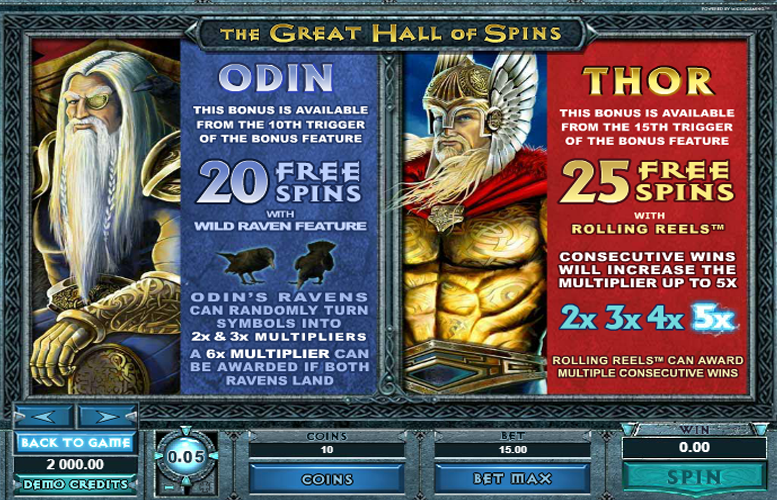 Players will receive 20 free spins with the “wild raven” feature. During this feature, Odin’s Ravens can randomly turn symbols into 2x and 3x multipliers. If both ravens land, a 6x multiplier can also be awarded. This bonus is available from the 15th trigger of The Great Hall Bonus feature. Players will receive 25 free spins with Rolling Reels. Each consecutive win will increase the multiplier. The increments are 2x, 3x, 4x, and 5x. These Rolling Reels can also award multiple consecutive wins. Ace or King = 150x the total bet. Queen or Jack = 125x the total bet. Ten or Nine = 100x the total bet. Since it’s a “ways to pay” machine, rather than one that relies on strict win lines, players are only able to adjust the value of each coin, along with the number of them waged on each of the supposed win lines. The game is priced as if there were 10 win lines. 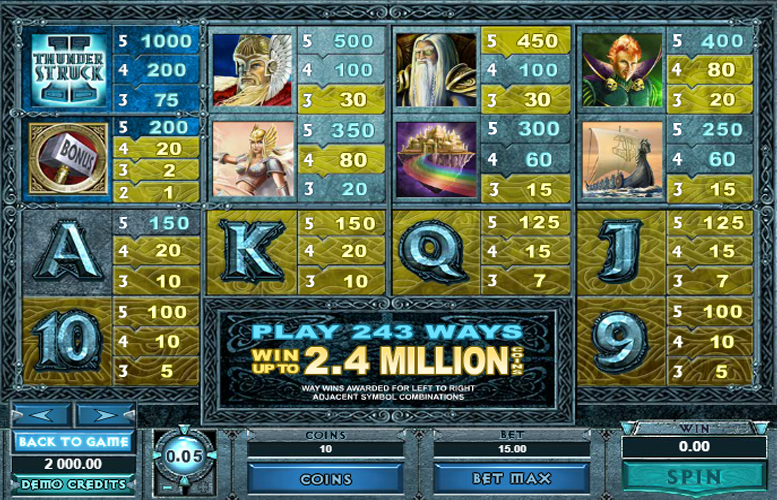 Players can bet between one and 10 coins on each of these lines. They can also set the value of each coin between 1p an 5p. This means that with all values set to the minimum, the lowest possible bet per spin is just 10p. Meanwhile, with all values maxed out, the highest possible bet per spin is a rather lacklustre £15. Evidently, Thunderstruck II was not designed for the highest rollers around. Thunderstruck II is a great game for fans of historical slot machines, as well as those who just enjoy a solid gameplay experience. With its classic art style and tastefully illustrated symbols, it certainly looks the part. Meanwhile, players will be delighted with the epic number of bonus rounds available. This makes Thunderstruck II ideal for repeat visits. One caveat to all of this is the feebly low betting limits. Whereas those who enjoy betting the bare minimum won’t find this an issue, anyone else might. This game has a rating of 4 / 5 with 396 total reviews by the users.